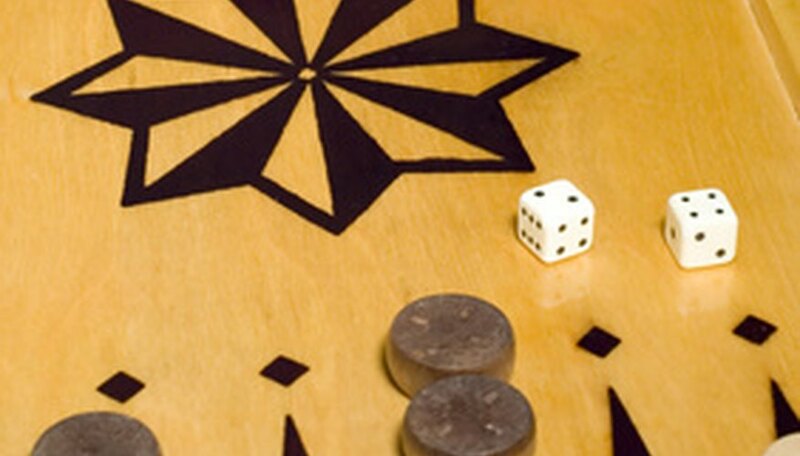 Acey-Deucey is a variant of backgammon that takes less time to play and relies more on luck than the traditional game. Like traditional backgammon, the object is to be the first player to remove all their playing pieces from the board. Place your 15 colored checkers off the board in a pile next to the opposing player's home board. One player's home board is the right side of the board closest to them, the other player's is the left side of the board closest to them. Roll one die for each player to determine who goes first. Roll both die when it is your turn to play. Enter a checker on the board by placing it on the point in your opponent's home board that corresponds with a number you have rolled and that does not contain two or more of your opponent's checkers. Count from the edge of the board, starting at one and ending at six in increments of one, toward the middle to determine the number for each point. Move any checker that is already on the board a number of spaces equal to the number of pips on any single die rolled. You may move the value of both dice with one checker only if you can legally move the number indicated on one die first. A checker can be moved to any point that does not contain two or more of your opponent's pieces. Move twice for each number shown when a double is rolled. For example, if a double two is rolled, you can move a total of four pieces, two spots each. Play the one and two normally when an Acey-Deucey is rolled. An Acey-Deucey is any roll of one or two. After moving the one and two normally, play any double roll of your choice, as if it has been rolled. After playing the double, roll again and play as normal. If at any time you cannot use any part of any of the rolls because there are no open points for your checkers to move to, you lose the rest of your movement for that turn. Place the opposing player's checker on the bar if any of your checkers lands on a point containing only one of your opponent's checkers. When a player has any checkers on the bar they must re-enter those checkers before moving any others. Checkers are re-entered by rolling a number equal to a point in the opponent's home board where your checkers can legally land. Continue moving checkers until all 15 of your checkers are in your home board. You cannot begin bearing off your checkers until all 15 are in your home board. Bear off a checker by rolling a number equal to the point at which it resides, then moving it off the board. If no checker is on the point indicated by the roll, then a checker from a higher point must be moved the number of points represented on the die. If there are no such checkers, then a checker from the highest point with a checker on it must be removed from the board. Continue playing until the first player removes all of their checkers from the board and is declared the winner.